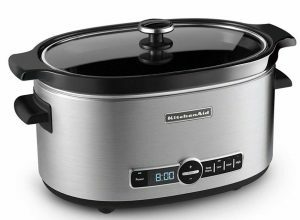 The best 6-qt slow cooker is possibly the most popular variety of this kitchen appliance. Thanks to its size, it is deemed a highly useful cooking appliance for many households. It’s the perfect pick for big families since it can feed up to 7 persons easily. It’s also a handy option for those who usually join potlucks since it will already let you bring a good amount of food for everyone to enjoy. If you’re the type to host dinner gatherings at home, this slow cooker size will also prove to come in handy since it will let you make a lot of food rather easily. It can whip up a good amount of food in one go, so it’s a convenient choice for a lot of folks. If you’re thinking of adding a cooking equipment of this kind in your home, you might want to go about it with great care, however. You’ll want the best product so you can make the most out of its performance. To help you in finding the right 6-quart slow cooker for your needs, make sure to read our quick guide below. How Big is a 6-qt Slow Cooker? One of the first things that you might want to know about 6-quart slow cookers is its exact size. Just how big are these appliances? How much food can they accommodate? How much space will they take up on your kitchen counters? According to experts, 6-quart slow cookers are the best options for those who often cook large batches of food. So if you often feed a crowd, this can be a great size option. It can definitely be a wonderful thing to have if you love having your entire family over during the weekends. If you want precise numbers, however, note that most units won’t fit exactly 6 quarts worth of ingredients. They usually accommodate about up to 5 quarts or 5 lbs of meat and other ingredients. It’s important that you don’t fill these cookers to the brim, however, as it can result in under-cooking and possibly even some spillage. In terms of physical size, these appliances can take up a significant amount of space in your kitchen. It would be best if you can find them a permanent spot on top of one of your counters so you won’t need to move them around. Storing them can be quite fussy, anyway, since they can get quite bulky. 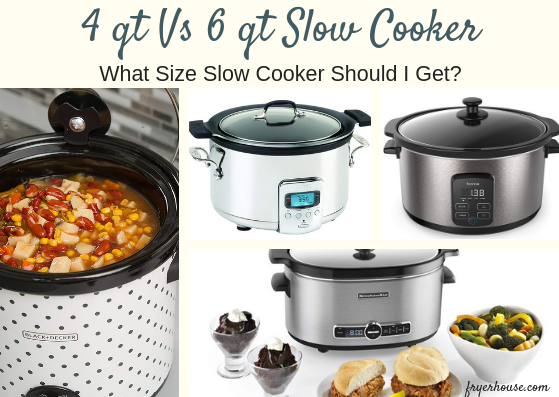 4 qt Vs 6 qt Slow Cooker: What Size Should I Get? Due to its massive size, it’s not uncommon for some folks to find themselves torn between the 4-quart and 6-quart sizes. There are instances where 4-quart varieties seem like a great option for some households but 6-quart units can still prove itself to be more versatile. How? 1. There’s an effective way to cook smaller portions on a large slow cooker. While the large cooker will come in handy on the weekends when family and friends come over, it might not be the easiest to work with on the days when there are just a few of you at home. What if you’re craving for some of the most tender meats on a Tuesday? It might feel like it’s a waste to use the massive slow cooker to cook just two or three pounds of meat. Doing so without the right techniques might also leave you with a dry and unsavory dish. But will you really be willing to wait for the weekend to make what you’ve been hankering for? While 4-quart slow cookers will prove to be great for four to five-person households, they will definitely be rather small if you love to feed a lot of people on the regular. Getting another small unit as a backup is always an option but might be too impractical for some folks. Not only will it cost you more money but it can also take up too much space at home. The fact that you won’t use the other unit often also seems wasteful. 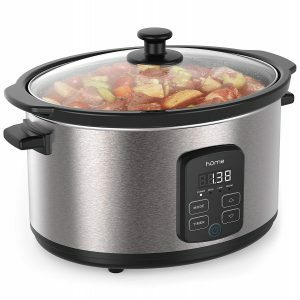 If the only thing holding you back from getting 6-quart slow cooker is the fact that you also cook small amounts of food often, you don’t really have a reason to shy away from this appliance. You can just opt to use a small oven-safe baking dish instead. With the help of this additional cookware, your dish can still take full advantage of the cooking technique of your slow cooker without the threat of overcooking. This will help you make your large slow cooker a lot more versatile. 2. 6-quart slow cookers will let you cook large chunks of meat. Aside from letting you cook large servings of food, you can also easily cook large chunks of meat on an equally big slow cooker. Thanks to the generous measurements of the crocks that come with these items, you can easily go get a large chunk of meat and not worry about having to chop them up before cooking. So if you love serving a feast from time to time and then reuse the leftovers after, a 6-quart slow cooker would be a good match for you. 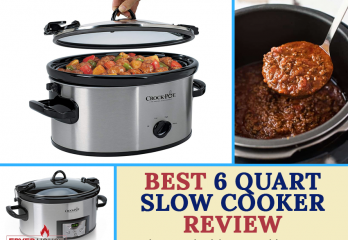 Need to get to know what the finest 6-quart slow cookers have to offer before making a choice? Our top picks might just convince you to give these appliances a shot. Starting off our list is one of the most affordable 6-qt slow cookers in the market today. For its size and performance, this product is deemed as a steal. This makes it the perfect budget choice for a lot of households. The best part? It’s designed for potlucks! Its clip-tight sealed lid effectively prevents spills. This means that you can transport it to just about anywhere without worrying about making a mess in the car. 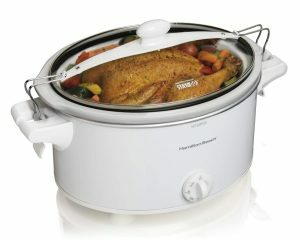 If you want a product that is highly rated by experts, then, the Kitchenaid 6 qt Slow Cooker with Glass Lid is for you. This product received positive reviews from respected culinary publications so it’s safe to say that you can count on this appliance to deliver great results. Its features also promise easy and convenient use, guaranteeing that it can help you whip up large batches of tasty dishes without too much fuss. You should definitely take a look at the Crock-Pot SCCPVL600S Cook’ N Carry 6-Quart if you’re looking for the best large-sized slow cooker. The fact alone that it’s from the original manufacturers of slow cookers definitely gives it an edge over its competition. So despite its manual controls, you can be promised of great quality by this very product. Its locking lid is also a great plus. With its size, it can definitely be the very appliance you need if you frequent potluck events. Those who hate using several pans to cook might just fall in love with the Hamilton Beach 6-Quart Programmable Searing Slow Cooker. This programmable slow cooker comes with a stovetop compatible crock so you can use it to sear your ingredients on the stove first before you slow cook your dish to perfection. It also comes with digital controls so you can precisely select your settings and cook your dish the exact way you want to. 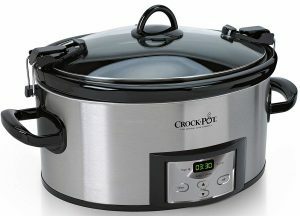 Another great product that offers amazing value for your money is the Crock-Pot 6-Quart Programmable Cook & Carry Slow Cooker. Aside from being from the original slow cooker makers, this product is also astoundingly affordable, so it’s easily considered as a steal. 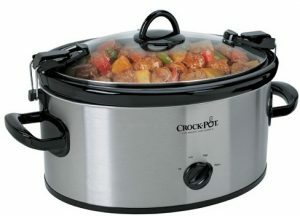 Many are surprised that a large-sized, programmable slow cooker from a reputable brand is offered at such a low price. So if you want the best slow cooker without spending an arm and a leg, this might be a good choice for you. 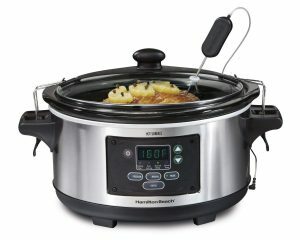 The Hamilton Beach 33969A may look a bit complicated at first glance but it’s actually packed with very convenient features that you might want to have in your slow cooker. You can simply ‘set it and forget it’ with its highly programmable digital controls and automatic warming design. But what really makes it stand out is its integrated temperature probe that will let you check the doneness of the meat your cooking with just a single press of a button. It’s as convenient as a slow cooker can get, making it a big hit among consumers. Those who prefer a straightforward but programmable unit will find the hOmeLabs 6-Quart Slow Cooker Pot a nice option as well. Its digital controls are as simple as a manual cooker except you can also program the cook time you need for your dish. So if you’re only really after a programmable cooking appliance with no other bells and whistles, this will be an excellent choice. 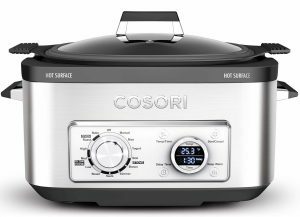 For a space-saving and multifunctional kitchen appliance, the COSORI 6 Qt 11-in-1 Programmable Multi Cooker would be a solid choice. 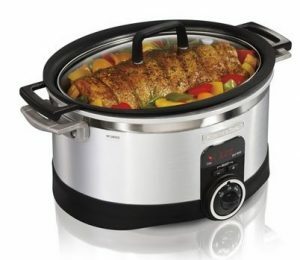 This product is not just a programmable slow cooker but a multi-cooker. It can function as a stove, oven, and specialty cooker as well, giving you more bang for your buck and counter space. Is your kitchen starting to get smarter? Then, the Crock-Pot Wemo Smart Wi-fi Enabled Slow Cooker would be a nice addition to it. This mobile app-operated kitchen appliance makes cooking all the more convenient as it will let you start cooking wherever you are. Note, however, that it doesn’t have actual controls on the unit and you’ll need the Wemo app to make it work. 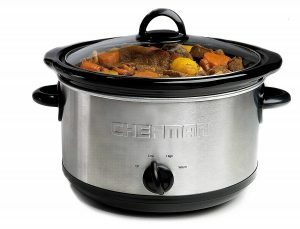 Rounding out this list is the Chefman RJ15-6-SS-R 6 qt Slow Cooker. This no-frills appliance is a round-shaped cooker that can help you whip up a large amount of food in one go. Combined with its affordability, it can be the perfect choice for no-nonsense households who need to get a lot of cooking done. 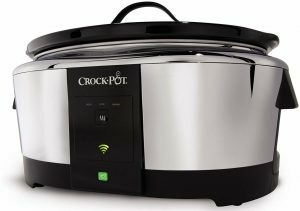 Buying Guide – How to Choose The Best 6-Qt Slow Cooker? After learning about your options, the only thing that’s left for you to know is how you can actually choose the best 6-qt slow cooker for your kitchen. Slow cookers are meant to make cooking food, especially large batches of it, easier. So it makes perfect sense that you should only go after a slow cooker that is very easy to use. Its controls should be simple and cleanups should be a breeze. This way, it can really be convenient to have around. These aren’t exactly must-haves as the most basic manual units don’t have them. But they can surely come in handy for a lot of households so they’re certainly worth having. You should also never compromise the quality of the materials and construction of this cooking appliance. Only go for something that is durable and dependable so you can be guaranteed safety and good value for your money. Product reviews will tell you some of the most important things you need to know about the products you’re eyeing. This is why it’s crucial to read them before you make a decision. Just don’t forget to be objective and discerning of the positive and negative feedback the product got, however. This way, you can really get the information you need to decide whether the item you like will suit your needs. Buying the best product you can afford is a universal rule that applies to all products, even with slow cookers. 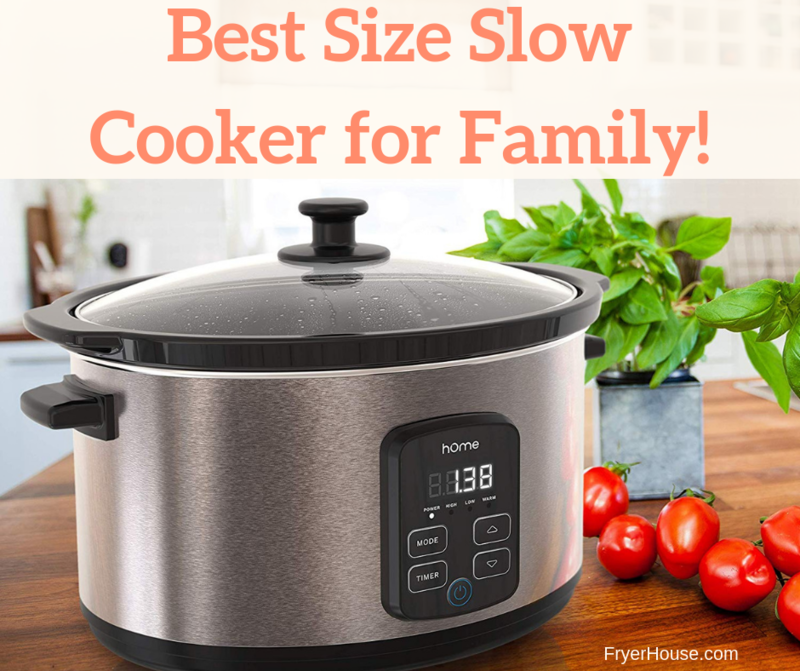 However, it’s entirely possible to find large sized slow cookers that are affordable and of excellent quality, so you shouldn’t miss out on them. The price tag on these products doesn’t always guarantee good performance or quality. This is why it’s best to just take your budget into consideration with all of the other tips above when choosing the best slow cooker. With all of the great options you have when it comes to the best 6-quart slow cooker, you don’t have to worry about your choices. What you should focus on instead is in deciding which one will meet you needs. This can be a tricky thing to do, so we hope our quick guide gets to help you weigh your options effectively.